During a regular session, the Central Election Commission (CEC) discussed the verification of the Constituency Election Commission’s (ConEC) protocol and additional documents on the repeat parliamentary election in Agdash constituency No.90 on June 18, as well as the protocol on the overall election results. CEC Secretary Arifa Mukhtarova announced that the CEC had verified ConEC’s protocol and the additional documents, and the elections were found to be in conformity with the Election Code. “Therefore, the protocol on the general results of the election regarding the repeat parliamentary election in Agdash election constituency No.90 should be drawn up,” she said. CEC Chairman Mazahir Panahov spoke next, noting that CEC had not received any complaints related to the election. “Therefore, we have decided to verify the election results and wrap everything up. I believe that the election was held in compliance with procedural requirements,” he said. At the end of the meeting, the CEC decided to submit ConEC’s protocol and the additional documents to the Constitutional Court for final verification and approval of the election results. 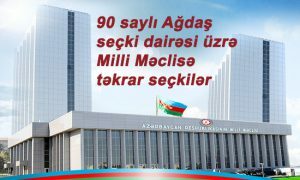 According to the final protocol, Yeni Azerbaijan Party candidate Javid Osmanov won the repeat election in Agdash constituency No.90. The Parliamentary elections were held on November 1, 2015. However, the Central Election Commission annulled the results of Agdash Election Constituency No.90 and a new election was held in June of this year.